When I last went back home, I experienced something quite unique. My parents, having grown older, are now looking forward to an altogether different period in their lives. All my siblings, having settled in different parts of the world, have left the house rather empty. It was once a house where the five of us used to shout, cry, play, laugh and sing at the top of our lungs. During the past five to six years, my siblings have left to other places, as they got married, found jobs and had children. Despite all the excitement, I found this particular visit home to be punctuated by their absence, as they were all heartily engaged in grown-up affairs. I, being the only single and student child of my parents, found myself attempting to escape this somewhat cold reality in a corner of our living room with a book. I picked up John Steinbeck’s East of Eden. The novel more or less helped me see myself and my siblings in perspective, as it sheds light on families growing geographically and emotionally distant. The novel unfolds the story of two families, the Trasks and the Hamiltons, and how they discover and find their paths in life across three generations. However, more intriguing was the idea of good and evil, which resonates throughout the novel through different characters. A lot has been written and discussed about Steinbeck’s attempt to draw a certain conclusion about this theme. According to Steinbeck, each one of us is presented with the choice to become either a good or evil person. He argues throughout the novel that nobody is born evil, it is a matter of choice. This idea is articulated in his incorporation of a concept from the Bible—Timshel, meaning one may. In East of Eden, good and evil are polarized, and we encounter people who are either completely good or completely evil. One such example of evil is Cathy Ames, a woman who sets her own house on fire, thereby burning her own parents. This is a perfect instance of a character that is born into a perfectly stable and lovely household, but elects to do evil. 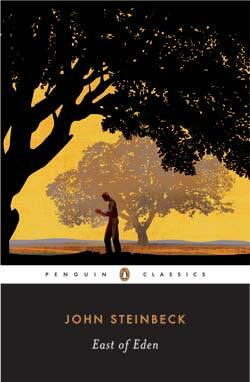 Steinbeck focuses on human beings determined to follow this particular course since early on in their lives. All the characters in the novel develop the instinct to differentiate between good and evil in their childhood, and they form a behavioral pattern which develops further into a firm constitution of either pure evilness or goodness. Till the very end of the book, Caleb, one of the main characters, constantly moves back and forth thinking that his evilness was injected into him. He studies his father’s behavior and, interestingly enough, he is the son of Cathy, who is a prostitute in a neighboring town .Yet, Steinbeck argues that our genes do not determine our fate and the choice between good and evil is exclusively ours. And we make this choice as individuals growing up; we choose to live either by doing good deeds or by spreading evil around us. This choice rules the rest of our lives. The notion of personal self-determination is just such a topic raised in the writings of Spinoza, particularly concerning his theory of good and evil, with which I have gotten acquainted in the courses here at ECLA of Bard. Spinoza argues that good and evil are just modes of thinking, as opposed to actually existing in the physical world. In a perfectly Spinozian world, good and evil are two different ways of thinking that an ordinary individual would use to label and define a certain situation, person or concept. Spinoza’s response to Steinbeck’s characterization of personalities as evil and good would be that Steinbeck had simply compared his characters’ behaviors among themselves and labeled them as either good or evil. For Spinoza, there is no real distinction between good and evil. Unlike in Steinbeck, it is not a path that we choose, it is a way of thinking about our own actions and how others perceive us. It is simply a way of judging human situations. For Spinoza, reality lies beyond good and evil. In Steinbeck’s book, we hear him actually passing judgments on how certain people choose their paths in this world. It seems to me that, whereas Spinoza considers all good and evil actions to be relative to us, he fails to take into account that certain actions are intrinsically harmful. This might be based on my too strict reading of Spinoza. However, Steinbeck’s account of human behavior informed me a lot more about how we as human beings are completely individual in our choices—regardless of the actions and lives of our forefathers. Our lives are a direct product of how we choose to live them and how we choose to affect others around us.